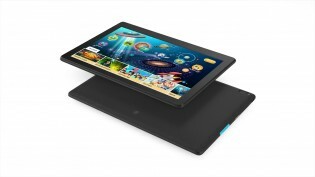 Lenovo unveiled a roster of five new tablets. They start with a super-affordable $70 slab and move up by building up multimedia prowess. The price of the top tow models hasn’t been revealed yet, but we can’t imagine it’s anything scary. These two are 10.1” tablets with a solid 1,920 x 1,200px screen, an IPS panel no less. And they are driven by a Snapdragon 450 chipset, which with its octa-core CPU is significantly faster that what the other three tabs have. The Lenovo Tab P10 is the top model and as such it has four loudspeakers around the screen (complete with Dolby Atmos). Which is pretty impressive, considering it has slimmer bezels than its sibling. It also has a large battery, 7,000mAh, while being lighter than the M10 – 440g. That battery should last for 15 hours of video playback. The P10 also has a fingerprint reader, which along with multi-user support makes sharing the tablet easier (each fingerprint is tied to an account). You also get more memory with this model – 4GB of RAM and 64GB storage. Better cameras too, 8MP AF on the front, 5MP on the rear. The Lenovo Tab M10 also has Dolby Atmos speakers, but only two of them. And the battery capacity is smaller (4,850mAh) while the tablet weighs a touch more (481g). The camera setup is 5MP AF on the back, 2MP on the front. This model has 3GB of RAM and 32GB of storage. Both tablets have microSD slots and will run Android Oreo at launch. Both the Lenovo Tab P10 and Tab M10 will be available later this year from Amazon. The cheapest of the bunch, it costs a mere $70. Clearly competing with the entry-level Kindle Fires, this one packs a 7” TN LCD display with 1,200 x 600px resolution. There’s a 0.3MP camera next to the display and a 2MP shooter on the back. 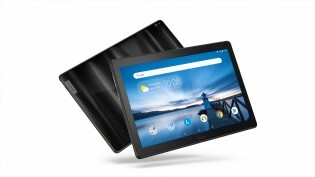 It’s an Android Oreo Go Edition tablet, which means modest hardware – MediaTek MT8167 chipset (quad-core 1.3GHz CPU), 1GB of RAM, 16GB storage and a microSD card. The battery is a small one, 2,750mAh, which Lenovo says is good for 5 hours of video playback. 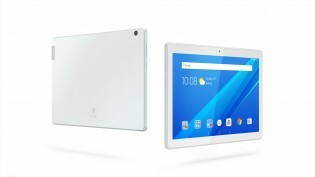 The Tab E7 will be available exclusively from Walmart, starting in October. Despite costing $130, this one is more in line with the P10 and M10. 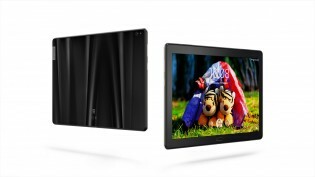 It sports a 10” screen (1,280 x 800px, IPS LCD) with front-facing stereo speakers with Dolby Atmos support. The chipset is a Snapdragon 210 with a quad Cortex-A7 processor (hey, the E7 uses Cortex-A35 cores, A35!). The RAM and storage have been slimmed down compared to the top models, 2GB and 16GB respectively. That’s still better than usual Android Go Edition hardware. The battery (4,850mAh) and camera (5MP and 2MP) are the same as the Tab M10. The Tab E10 will also be available exclusively from Walmart starting in October. We left this one for last as it’s a tad perplexing. It’s a $100 tablet that has a few things going for it – an 8” 1,280 x 800px IPS LCD and a single Dolby Atmos speaker on the front. It has the same battery 4,850mAh battery (10 hours of video playback) and camera (5MP and 2MP) as the Tab M10 and E10. However, it runs Android Nougat (no Go Edition here) on hardware not meant for it – a MediaTek MT8163B chipset with quad A53 cores, 1GB of RAM and 16GB storage (plus microSD slot). 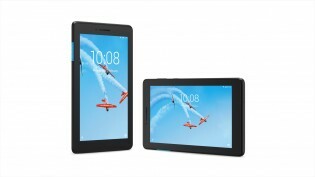 The Tab E8 is available at Walmart today. The hinge on the Yoga tablets was a problem, too. Great thought, but pretty bad in practice. The platform that rolled out of the back was too small. The device was too bulky, to pack or carry. 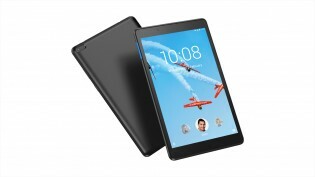 Isnt the old Lenovo Tab 4 8.0 is better choice selling at $120? Unless the Tab P10 is around $150 then it is good. I also remember their Tab 4 10 Plus similarly speced like the P10 was around $250.